Trash threatens the lake’s beneficial uses, Natural beauty and wildlife. Floating and submerged trash is a danger to boaters. There is risk of injury to birds and animals. Chemical residuals in aerosol spray cans could seep into the lake. Anyone seeing this blight would wonder how Jordan Lake could be a public water supply. If these stains upon the land are not removed, the local economy can be hurt if lake users go elsewhere. Heavy red line represents boundary of the Haw River Watershed (1,400 square miles) and heavy pink line, the boundary of the New Hope Creed Watershed (300 square miles. Many, many little creeks, streams and rivers feed into these two major sources that enter Jordan Lake. The Haw River watershed at the southern end of the lake comprises a land area of about 1,400 square miles and the New Hope River at the northern end accounts for an additional 344 square miles. While much smaller in area, the New Hope River watershed is highly urbanized. About 720,000 people live in these two watersheds. Rapid urbanization throughout the watersheds over the last 30 years is evident in Google Earth Engine Time Lapse. Click on the arrow in lower right of map to see history unfold and click on + or - to see smaller or larger area. Surprisingly, recreational use is NOT the major source of trash although it is a terrible eyesore. Instead, anything on the land in the vast watershed of the lake can be flushed away by heavy rainfalls directly or through storm drains into streams that eventually feed the lake. Trash found on the shoreline at the entrance to the lake from the Haw River, far above recreational use areas, is proof that it originates from the watershed. In addition to the usual expectation of bottles, cans and plastic packaging, our volunteers routinely find children’s toys, dolls, basketballs, softballs, baseballs, soccer balls, fuel and hydraulic fluid containers, pesticide spray applicators, cigarette lighters and much more. Most recently, a water meter cover from the City of Greensboro was recovered. Even refrigerators, orange road construction barrels, hot water heaters and tires (many still on rims) are found along the high water mark of many remote coves, especially on the Haw River Arm of Jordan Lake. 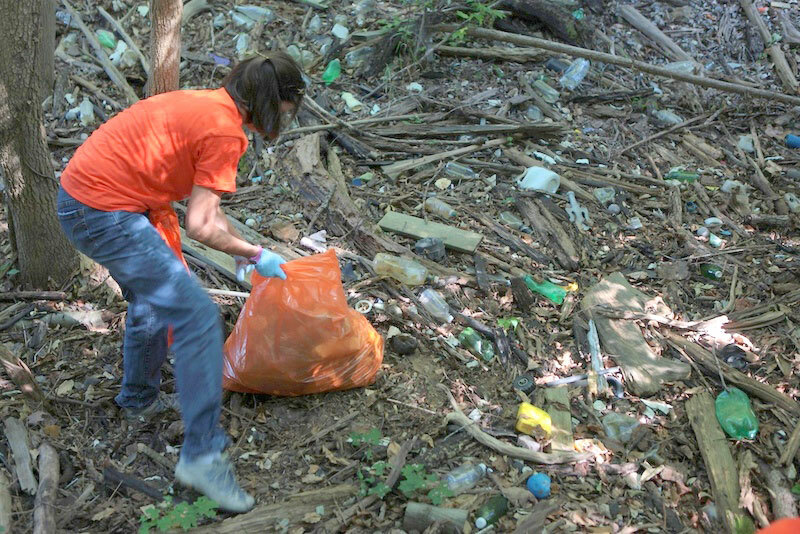 Trash ends up hundreds of feet into the woods above the shoreline. This happens because the lake level rises after rainfalls. Here is a sample of historical record of lake level rise and associated rainfall in one month. A rainfall of less than 2 inches early in the month caused the level to increase by 3 feet. Vivid evidence of the stormwater-trash connection was collected by Clean Jordan Lake. We keep records of the miles of shoreline and the bags collected in each cleanup event. From USGS gauging station records, we count the number of lake level rises (LLRs) greater than 2 ft between cleanings of subsections of shoreline along the Haw River Arm (HRA), Stinking Creek (SC) entering HRA, Kirks Creek (KC) entering main channel near the dam and the southern end of the New Hope Channel (NHC) above joining the HRA. These LLRs are in response to rainfall of about 1 inch or greater. The pounds of trash per 100 feet of shoreline is plotted below against the number of LLRs between cleanups of each subsection from 2013 to summer of 2017. The scatter is too great to conclude that trash increases with more rainfall events in between successive cleanups. One explanation is that not all LLRs produce the same trash flushing action. For example, 6 LLRs that are all low in magnitude (say 2-3 ft each) are the result of low intensity/duration rainfalls that would not flush as much trash as 6 LLRs comprising low and high magnitude events. Replacing the number of LLRs on the x-axis by the average height of LLR between successive cleanups is a way to account for rainfall intensity/duration. As shown below, it results in a stronger positive correlation with trash on the shoreline. Our GIS Trash Map provides a lot more insights into the volunteer effort to remove trash from about 20 miles of shoreline.